Turok: Dinosaur Hunter was originally released in 1997, and the title pretty much spells it out. There's a story about an ancient birthright and the Lost Land and an evil invader and an unimaginably powerful artifact called the Chronoscepter, but what mattered is that there were dinosaurs and you could hunt them. And the word on the street is that, at some point in the relatively near future, you'll be able to do it again. The rumor emerged from a TechRaptor interview with Samuel Villarreal, a level designer on FEAR: Perseus Mandate, Section 8, and Aliens: Colonial Marines, who's "rebuilding" the obscure 1996 shooter Powerslave. In it, he said he'd been working on an update of the Nintendo 64 version of Turok before starting on the Powerslave redo, but "put [it] off to the side" for some reason. And then he got to the interesting bit. 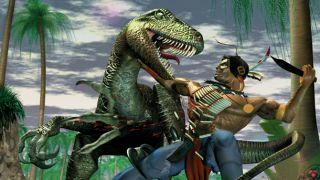 "Since now Night Dive Studios has picked up the rights to re-release it, Turok EX will resume development later this year," he said. He added that he's worked with Night Dive previously on Strife, the 1996 FPS that hit Steam last year. Night Dive, you'll recall, specializes in bringing old classics to modern hardware: Its ports include System Shock 2 and I Have No Mouth and I Must Scream; it also came tantalizingly close to resurrecting the great No One Lives Forever, although that deal ultimately fell through. We've reached out to Night Dive for comment, and will update when we can.